George Morris Harris, beloved father, grandfather and great grandfather passed on to Glory on December 29, 2018; preceded by his wife of sixty-two years, Nancy, who passed on December 11, 2012. 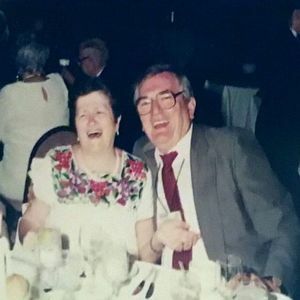 They are both missed by their son George, their daughters Kathleen and Jennifer and their son-in-law-law Michael, as well as their grandchildren Krista, Tom, Christopher, Michelle, Brittany, Chelsea and Ashley. Their great grandchildren are Noah, Trevor, Andrew, Alexis, Seth, Jude, Colin, Lily, Evie and Tommy. George and Nancy lovingly blessed their family and friends all their lives. They loved to play Bridge together all their lives, and George very much enjoyed playing poker, especially in his retirement with his good friends on Longboat Key. He also requested that his love of pineapple upside down cake would be mentioned. Nancy loved to make it for him. George was a chemical engineer with a degree from the Illinois Institute of Technology in 1950. He was a pioneer in the development of gas and oil pipeline coatings, and his expertise was sought after all over the world.